You hear it all the time: The 2018 Senate map is bad, even “brutal,” for Democrats. Of the 35 seats on the ballot this cycle, 26 are held by senators who caucus with the Democrats, and just nine are held by Republicans. Democrats must flip two of those nine — without losing any seats of their own — in order to take a Senate majority. That’s not going to be easy given that only one of those Republican-held seats is from a state carried by Hillary Clinton in 2016. At the same time, 10 Democratic incumbents are running for re-election in states won by President Trump, including deep red ones like North Dakota and West Virginia. But while the 2018 map is the party’s steepest uphill climb in a long time, defending red-state Senate seats isn’t a new challenge for Democrats. In fact, they’ve gotten pretty good at it over the years. They haven’t had a choice: It gets less ink than the gerrymandered districts in the U.S. House, but the Senate — which reserves the same number of seats for a sparsely populated state as for a crowded one — has an inherent Republican bias as well. Within the past 25 years, Democratic majorities in the Senate — up through 1995, briefly from 2001 to 2002 and then finally from 2007 to 2015 — were possible because more Democrats represented red states than Republicans represented blue states. To wield a majority in 2019 and beyond, Democrats will simply (OK, not so simply) have to pull off the same trick. That’s a lot of numbers, so let’s simplify things a bit. To measure how “bad” the map was for a given party, let’s subtract the number of seats on the ballot in blue vs. red states from the number of those seats each party held going into the election. The result is the net number of senators representing states of the opposite party. We’ll call these FRITZ4 seats, in honor of former South Carolina Sen. Fritz Hollings, who represented South Carolina as a Democrat for 38 years. Democrats have 10 FRITZ seats (Democratic incumbents in red states) up for election this year, and Republicans have one FRITZ seat (Dean Heller of Nevada, the only Republican incumbent in a blue state), so 2018 has a net FRITZ score of -9 (from the Democratic perspective). 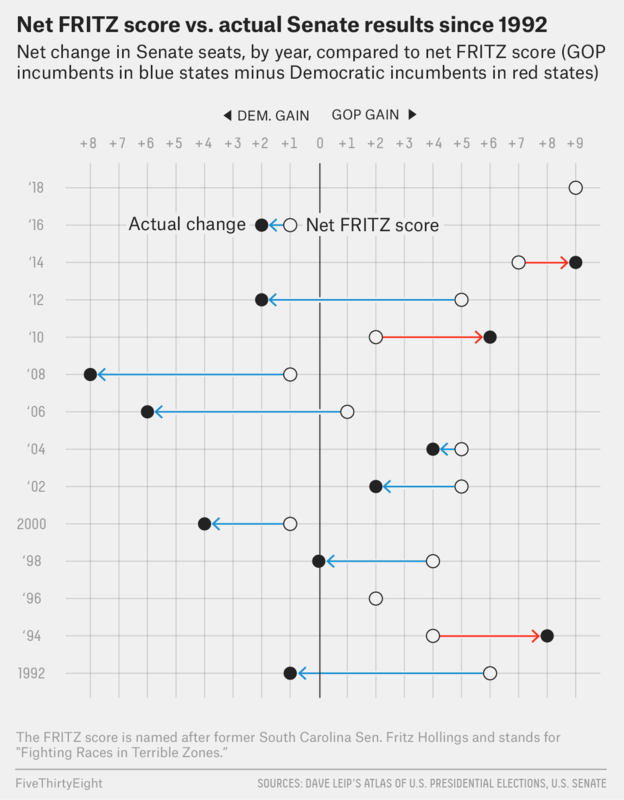 The net FRITZ score represents how many Senate seats we would expect a party to lose if partisan lean were the only determinant in that year’s Senate elections. Next, we want to know how many seats actually switched parties in the election. Finally, let’s compare the actual net gain with the net FRITZ score to quantify how that “good” or “bad” map affected each party’s success. This difference — represented by the arrows in the chart below — tells us how many more or fewer seats a party won than it “should” have based on partisanship alone. At least since 1992, Senate elections haven’t been a slave to the partisanship of the states where they have occurred. In fact, Democrats have regularly faced unfavorable Senate maps (albeit none as bad as 2018’s), and they have regularly overperformed anyway, winning an average of 2.4 more seats per cycle than they are entitled to based on partisan lean alone. Much of this is likely because of the advantage of incumbency, but on three occasions (1992, 2006 and 2012), Democrats have actually gained Senate seats despite being at a partisan-lean disadvantage.5 Only in three famously strong GOP wave years (1994, 2010 and 2014) have Republicans overperformed the partisan baseline. The good news for Senate Democrats is that, given the party’s healthy lead in generic-ballot polling, they are likely to overperform again this year.6 The bad news is that overperforming by enough to take back control would be unprecedented (at least in modern history). As mentioned above, Democrats’ -9 net FRITZ score in 2018 represents their worst position since 1992, and their best overperformance during that time frame has been +7. If Democrats repeat this and win seven more seats this year than partisan lean would suggest,7 that would translate to a Republican gain of two seats. Democrats need to overperform by a whopping 11 seats in order to snag a majority. Still, Democrats should probably be thrilled with an overperformance of even half that. It all comes back to that pesky Republican bias in the Senate — and specifically its lopsided distribution. In short, 2018 could be not just bad, but a veritable armaggeddon for Senate Democrats. They should count their lucky stars that their worst-case map looks like it’s going to coincide with their best-case turnout environment. The Senate isn’t just biased toward Republicans; it’s really biased toward Republicans. Going by partisan lean, there are 31 states more Republican-leaning than the nation as a whole compared with just 19 states more Democratic-leaning. Because each state has two senators, that means 62 Senate seats (a filibuster-proof supermajority) are Republican-leaning and 38 are Democratic-leaning. But thanks to the Democratic overperformance we’ve been talking about, Republicans hold only a 51-49 majority. Democrats have achieved this by electing a total of 14 senators in red states while holding Republicans to only three senators in blue states.8 That’s a lot of Democratic FRITZ seats. The Senate is divided into three “classes,” with one class on the ballot every two years. Each class has approximately the same number of senators but, because of the way elections have shaken out, not the same number of FRITZ seats. Specifically, 10 of those 14 red-state Democrats are members of Class I, which is up for election in 2018. Independents are counted as members of the party with which they caucus. Class I does not include this year’s two special elections, which are filling Class II seats. Politics Podcast: How Much Trouble Is Joe Manchin In? Even as it is, of course, Democrats are still two seats shy of a majority. Let’s assume that 2018’s bulwark of red-state Democrats holds, but Republicans don’t lose any seats either — a status quo election. How do the 2020 and 2022 Senate maps look? They’re better for Democrats than their unprecedented 2018 jam, but the fundamental problem of the Senate map bias remains. In 2020, there are still more Democratic FRITZ seats on the ballot (three) than Republican ones (two).10 In 2022, as things stand right now, only one Democratic FRITZ seat is up for election, but there is a grand total of zero Republican FRITZ seats for Democrats to target. Of course, the further we get into the future, the less we can say with confidence — party coalitions change, voter allegiances shift.11 But the lack of places in which to make Senate gains will likely haunt the Democratic Party beyond just this year. The lone Republican FRITZ seat on this year’s ballot, Heller, represents a full third of Democrats’ best targets in the entire Senate. Given the possibility of a Democratic wave election, 2018, even with its redder second-tier Democratic targets like Arizona and Tennessee, could actually be the party’s best chance in the next six years to capture that elusive majority. So maybe Democrats’ bad map isn’t a 2018 problem. Maybe it’s a Senate problem. The average difference between how a state voted in the previous two presidential elections and how the country voted overall, with the more recent election weighted 75 percent and the less recent one weighted 25 percent. This includes all the Senate seats that were regularly scheduled to be up for election that year, plus any special elections that were held concurrently with the November general election. For example, the 2018 Senate races consist of 33 regularly scheduled elections plus special elections in Minnesota and Mississippi — but not the irregularly timed special election last year in Alabama. We counted independents as members of the party with which they caucused. In fact, that success is part of what put them in such an overexposed position today; the seats that were on the ballot in 2006 and 2012 are the same ones that are up again this year. That is, they will probably not suffer net losses of nine or more seats. Which wouldn’t be unusual at all — it’s happened four times in the past 13 elections. True, many of those red and blue states are more like purple ones — for instance, New Hampshire has two Democratic senators despite voting slightly more Republican than the national popular vote in the past two presidential elections. While states like this are prone to swinging between red and blue, there aren’t enough states that might realistically switch from red to blue to reverse the overall imbalance. As of right now, this Democratic nightmare scenario looks unlikely, but it probably wasn’t too far from becoming reality. According to one of the most immutable laws in politics, if Hillary Clinton had been elected president instead of Donald Trump, 2018 would likely be shaping up to be a Republican wave election rather than a Democratic one. Given the 10 Democratic FRITZ seats on the ballot in 2018, it’s not hard to imagine Republicans landing such a knockout punch under a President Clinton. This is assuming no changes in who controls these seats between now and then, which could happen if a Republican wins the 2018 Minnesota special election, a Democrat wins the 2018 Mississippi special election or a new vacancy arises, such as in the Arizona seat currently held by John McCain. The results of the 2020 presidential election, for example, may change which states are Republican-leaning and Democratic-leaning according to our partisan lean metric; the best we can do for now is to judge states by their current partisan leans.